Angas figures. Height: 53,3 & 55,9 cm. Image courtesy of the Fine Arts Museum of San Francisco, The de Young Museum, San Francisco, CA., USA (#1996.12.34.1 & 2). An error often made in the trade concerns the attribution of the above type of figures. They are often mistakenly listed as Montol, or even Chamba. 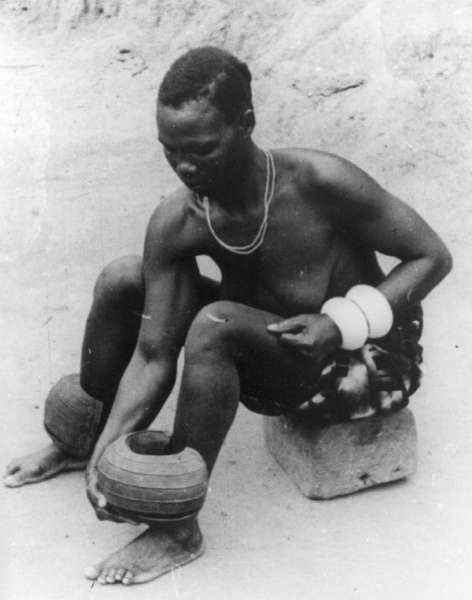 In fact, they originate from the Angas (Ngas), the largest ethnic group on the Jos Plateau and neigbours of the Montol. They are situated in the Eastern escarpment of the Jos-Highland Plateau. It’s an easily recognizable style, clearly distinguishable from the more chunky Montol iconography. It was Barry Hecht, a renowned collector of Nigerian art, who informed me about this general misconception. Martial Bronsin confirmed this attribution to a private collector from Brussels. Most likely these figures were used in a context similar to the Komtin cult from the Montol. In Central Nigeria Unmasked, a book discussing Middle Benue sculpture, not a single reference to the Angas can be found. For now, I haven’t been able to find any relevant literature. Any further information about this type of sculpture is thus very welcome. Angas figure. Height: 46 cm. Image courtesy of a private collector in Brussels. Angas figure, with child on back. Height: 55 cm. Image courtesy of Sotheby’s (Sotheby’s, Paris, 5 December 2006. Lot 191). This entry was posted in Objects, Research and tagged Angas, Montol on February 28, 2014 by admin. 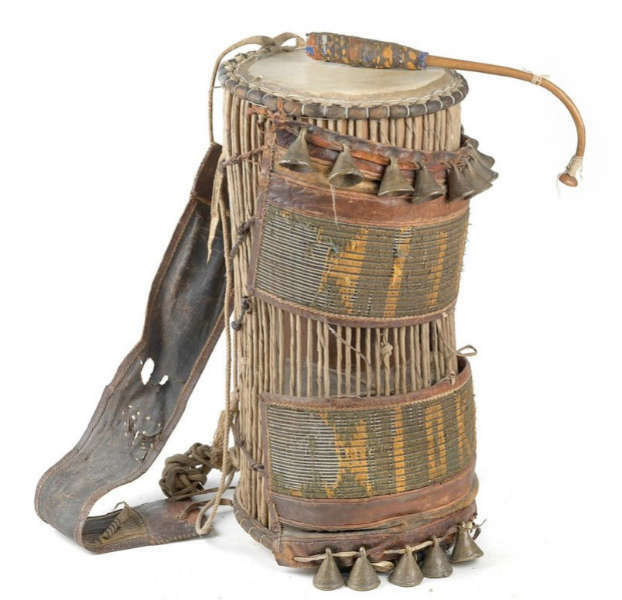 An object you don’t often come across at auction, a talking drum from the Yoruba. The above example was acquired in the palace of the Oba of Oyo in the early 1960s and will be sold by Dorotheum next month; more info here. 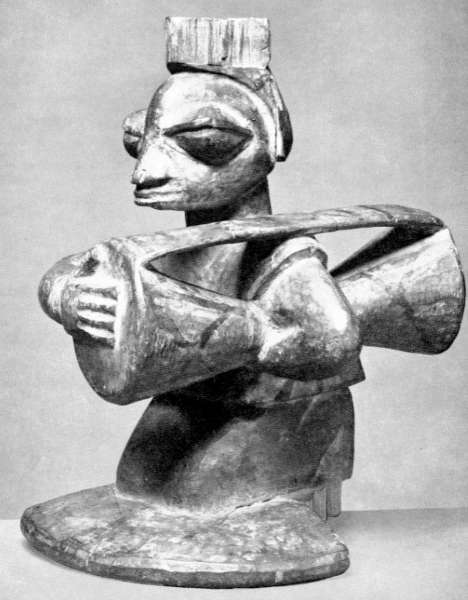 Yoruba drum player. Published in: Rivallain (J.) & Iroko (F. A. ), Yoruba: masques et rituels africains, Paris, 2000: p. 91. 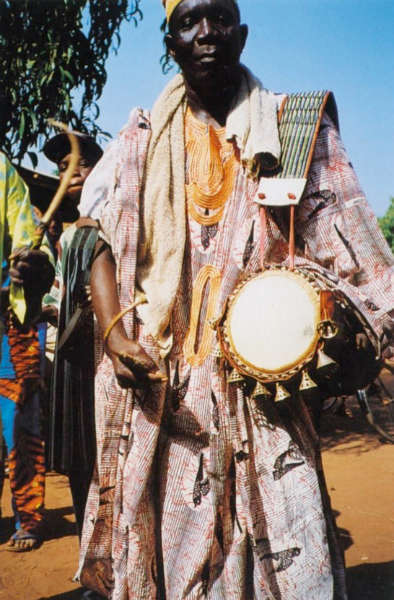 Yoruba agere ifa featuring a drum player. Height: 18,5 cm. Collected by Leo Frobenius in 1912. Image courtesy of the Ethnologisches Museum (SMPK), Berlin, Germany (III C 27097). 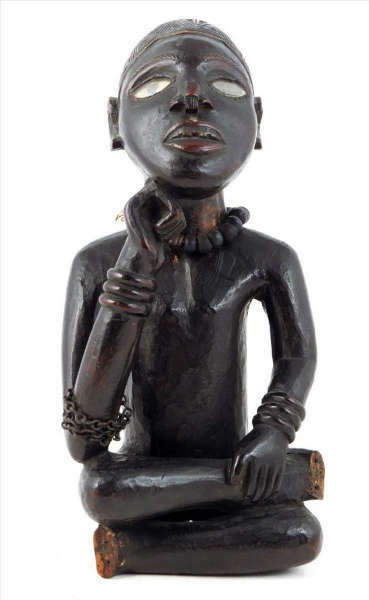 This entry was posted in Auctions, Objects and tagged Yoruba on February 25, 2014 by admin. The above field-photo was made by Hans Himmelheber among the Baule in 1933-34. It’s rare to find a photo documenting these large brass anklets, as well as the typical ivory bracelets. You can find more than 100 additional field-photo’s from Himmelheber on the website of the Ethnological Museum of Berlin here (search for Himmelheber). In wooden sculpture you never encounter these large anklets, but the ivory bracelets sometimes are represented. UPDATE: never say never; a reader was so kind to send me this (unfortunately blurry) picture of a female figure wearing anklets. Published in El Primer Eros, Barcelona, 2004. This entry was posted in Research and tagged Baule, Field-photo on February 24, 2014 by admin. Discussing the sale of the Jan Krugier collection (info), journalist Scott Reyburn from the NY Times just coined a new term: the nostalgic premium (source). This is the extra money buyers are wiling to pay for works that emerge from “connoisseurial” collections. This term sprang forth in a recent discussion (here) concerning the unpredictability of art prices and the risks of art investment. The nostalgic part refers to the period in time when collectors were still shaping the appreciation of art and were less pre-occupied with the financial aspects. This nostalgic premium is of course a notion that has been known for a long time in the African art world. Especially the auction houses (who love premiums altogether) have been very aware of the positive effect of a famed provenance on prices. Most recently the Sotheby’s sale of the Stone collection (info) and Christie’s sale of the Bartos collection (info), with multiple pages in the sale catalogue dedicated to the biographies of the collectors, prove they know how to use the nostalgic premium to their advantage. But also in galleries, this premium is widely added to the normal price. Personally, I don’t think an object gets any better once having been in this or that collection, it adds nothing to the inherent strength of a piece – but that’s another multi-faceted discussion. This entry was posted in Opinions on February 21, 2014 by admin. 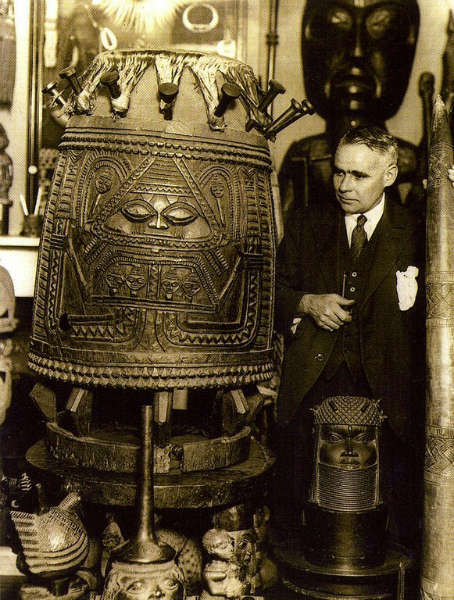 In case there’s nothing worth watching on television, you can always watch this lecture from Dr. Herbert M. Cole (Professor Emeritus of the History of Art, University of California, Santa Barbara) speaking at the Williams College Museum of Art (Massachusetts) about Nigerian art. This entry was posted in Research on February 20, 2014 by admin. I received an interesting note from my mentor Guy van Rijn today. I think that you use the word ”sleeper’ in the wrong sense. A sleeper in an auction is an object that stays unnoticed, but the expert with a keen eye has spotted it and will buy it at very fair price. For example, a Congo figure was sold in 2006 on Ebay for € 10,000,-; the next week it was sold for more than 1 million. Discretion stops me to show a photo (insiders know about this story). An object that will make a much higher price than the estimation, is a totally other thing. 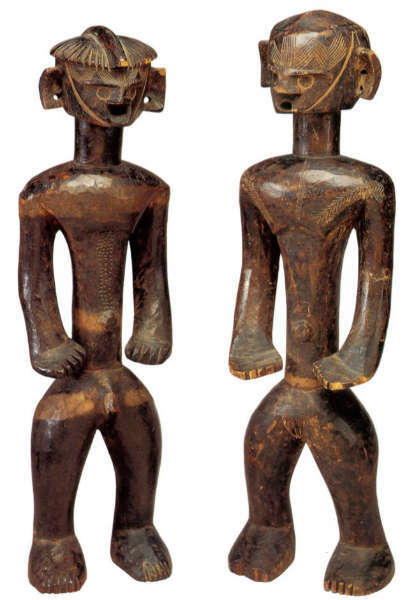 This Teke figure, for example, could have been a sleeper, if it wouldn’t have been discovered by numerous interested parties and made a record price. Teke figure. Height: 36 cm. Sold for € 198,000 (premium included) by Hôtel des Ventes Victor Hugo (Dijon) on 9 February 2014. A) It is possible that an expert-dealer or collector has spotted an object with a too low estimate because certain provenance was unknown to the auctioneer. The full provenance is missing because the seller did not know it, and/or the auction expert did not have the time to do the proper research on it. This Baule tapper for example was sold by Lucien Van de Velde in the 1970s, information unknown to Native, and with a positive effect on its actual value. The same often happens with objects that were published long ago. B) The auction expert knows, but uses an object as a teaser to lure buyers. He deliberately appraises an object with a very low estimate. Collectors will be attracted and hopefully bid more eager on this piece, and on the rest of the auction, than with a high estimate. A good example is the cover lot of the last Lempertz sale in Brussels, estimated € 10,000-20,000,- this top quality Korwar made € 105,000,- (including costs € 133,000,-). C) Overpaid. Let me state here first that a great object is hardly ever overpaid. But it happens that two bidders will not give in, and a less important object will make a price that is not comparison with the market value, “it takes two to Tango”! The Songye axe below might be the best example of these last years (info); it sold for almost 100 times its estimate. 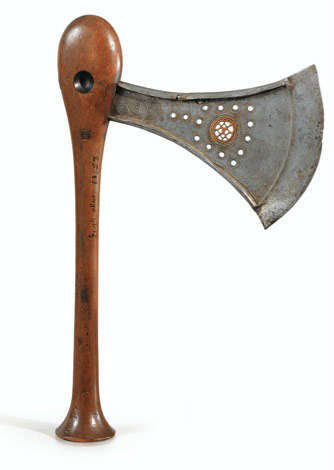 Songye axe. Collected by Leo Frogenius between 1910-1912. Estimated at € 4,000-8,000,- and sold for € 384,750,- Image courtesy of Sotheby’s. D) A last reason is less ethical, a dealer who sells a piece at auction and lets a friend do the bidding by phone (unknown by the people in the salesroom). In the meantime the dealer advised/convinced an ‘amateur’ ( the third person, or actual buyer) to buy at a high price. This could be a nasty “wake up call” some day! So the sleepers I have been posting on my blog were in fact wide awake. The auctioneer might have been sleepy, the bidders were not. I might need a new term. I am not sure my understanding of the term ’sleeper’ is consistent with that of Mr. van Rijn, at least in the US. It means here ‘unanticipated success or recognition’. In politics, for instance, it refers to a candidacy, pundits wrote off, but the candidate showed surprising strength, if not victory. Your use of terms and examples cited by Mr. van Rijn are entirely consistent with this definition and usage of the term ’sleeper’. A more common term in politics but still applicable elsewhere is ‘dark horse’ essentially conveying the same meaning. This entry was posted in Auctions, News and tagged Songye, Teke on February 18, 2014 by admin. On 4 & 6 March 2014, Sotheby’s London will auction the private collection of the late Stanley J. Seeger. The sale is called “1000 ways of seeing“, so the cyclops illustrated above fits wel in (info). It’s attributed to the Fon, which is of course quite a stretch since cyclopes belong to ancient Greek mythology. UPDATE: A reader informed me this figure might also have been inspired by a deformed one-eyed baby. On a serious note, there do are some interesting objects in this ecclectic 1000-piece sale. A rare Punu blacksmith’s bellows (info) is estimated at only £ 800-1,200,- while the same Sotheby’s London sold the same bellows almost 30 years ago for £ 1,430,- (3 December 1984. Lot 155). Also underestimated is a nkasopi Attié figure. Appraised at £ 5000-7000,- it was made by the same artist that carved an almost identical figure sold by Sotheby’s Paris last year. Estimated at € 12,000-18,000,-, that figure made € 35,000,- (info). 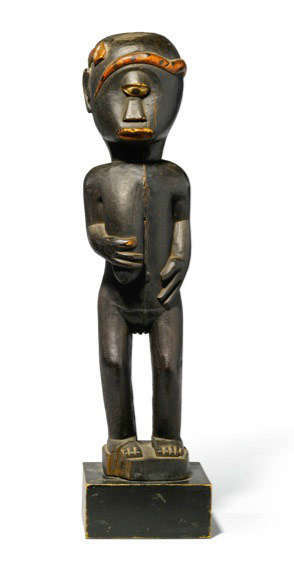 The most important African object in the sale is a Kota figure. Acquired at Sotheby’s London in the same 1984 sale (lot 156) for £ 2,200,- it is now estimated at £ 10,000-15,000,- and should be able to sell for much more. Probably it’s not Kota, but Sango (Sungu). For a nice article about Stanley Seeger click here. This entry was posted in Auctions and tagged Kota on February 17, 2014 by admin. A rare video documenting the famed collection of William Oldman (1879-1949) in London. This film, uploaded on Youtube by Kevin Conru, was edited using Oldman’s personal 16mm print copy and shows rooms packed with carvings, weapons and other art objects squeezed into every available space. This entry was posted in Collectors on February 16, 2014 by admin. This spring, 26 Parisian galleries participate in a new event called Paris Tribal. It’s clear that in order to compete for the attention of collectors, galleries are creating more and more events like this. The rapid growth of such happenings is changing the way galleries operate on a substantial level. As we can read in the press text, most participants prepared a thematic exhibition. In the short period of 4 days, they of course hope to make significant sales. A combined marketing budget, should be able to lure many visitors. Apparently, this event is also a bit about positioning. 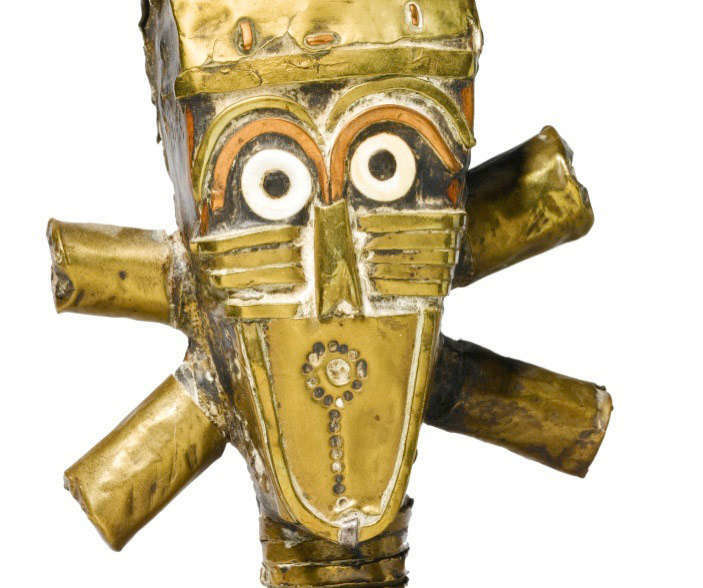 On the website, we read that Paris Tribal “confirms Paris as capital of tribal arts“. I’m always suprised by this nationalistic reflex in the globalized world we live in today, but I guess competition is stiffer then ever. Anyhow, it sounds like a great excuse for a trip to Paris. This entry was posted in Fairs on February 15, 2014 by admin.